A Mira Monte high school student lost his cap and gown to an apartment fire Wednesday afternoon, hours before he was set to wear it and walk across the stage at graduation. Around 3:20 p.m. the Kern County Fire Department responded to the area of Dr. Martin Luther King Junior Boulevard and Virginia Street for reports of an apartment fire. When officials first arrived on scene they found a fully-involved apartment building with all four units on fire and apartment buildings on both sides threatened. Officials had to call in extra resources to get a handle on the fire. Fire crews put out the flames, but not before eight apartments were damaged, leaving six families and a total of 15 people needing help from the Red Cross. In one of the apartments that caught fire was 17-year-old Raul Chavez's cap and gown for his graduation. He was set to wear it and walk across the stage at Mira Monte High School at 7:00 p.m., but because of the fire his cap, gown and clothes were destroyed. 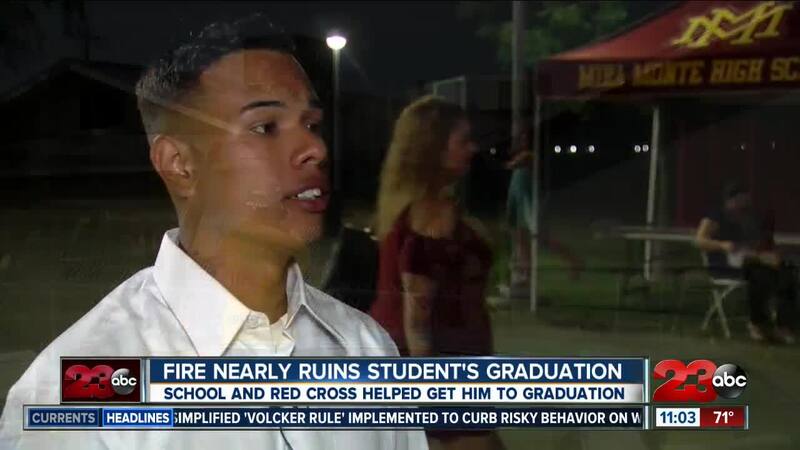 Officials with the Red Cross said Mira Monte High was able to get him another cap and gown in time for him to attend the graduation. He and his family were running behind schedule, but were still able to make it to the graduation and Chavez was able to walk across the stage.